Patients increasingly expect to retain their natural dentition and are often reluctant to have teeth extracted. Endodontic retreatment can offer the patient a second chance to save a diseased root-filled tooth that would otherwise be extracted. Why does Root Canal Infection Occur? Narrow or curved canals which were difficult to treat and therefore a persistence of infection within the root canal system. Complicated canal anatomy that was either disregarded or undetected during the initial treatment. New decay/broken filling which exposes the root canal filling to bacteria. 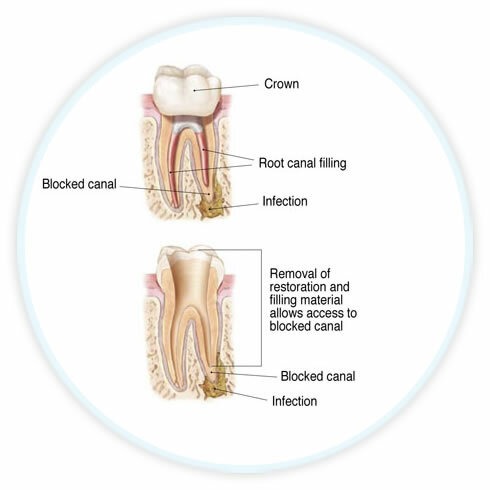 The root canal retreatment procedure involves reopening the tooth to gain access into the root canal system. Majority of the time, the existing crown on the tooth can be retained. Following removal of the existing root filling, the canals are properly cleaned to specialist standards. Once re-cleaned, the canals are carefully examined with an operating microscope to search for any additional canals or unusual anatomy that requires management. A new root filling is subsequently placed followed by a new restoration. You will be referred back to your dentist if a new crown is required. Many patients and general dentists alike still believe that the success rate for retreatment cases are much lower than previously untreated cases. This may have been the case thirty years ago prior to operating microscopes being considered the “standard of care”. The small percentage of cases that did “fail” were usually difficult cases to begin with that required high magnification to adequately treat. Today, studies show that the success rate using current states of the art techniques is identical to standard treatment cases. Initial consultations at Malvern Endodontics are $190. The cost of your root canal retreatment will depend on your individual circumstances. To find out more, please contact our friendly team today, who can explain our procedures in depth and provide more information on retreatment costs.